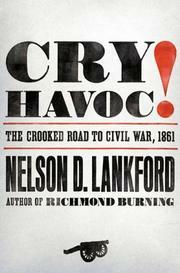 Southern historian Lankford (Richmond Burning, 2002, etc.) traces the final steps to the Civil War. He begins with John Brown’s 1859 raid on the U.S. arsenal at Harper’s Ferry, Va. Troops led by Robert E. Lee quickly crushed his attempt to start a slave revolt, but the event polarized the nation. Northern abolitionists treated Brown’s death as martyrdom for a great cause; Southerners saw it as a barometer of Yankee hatred of their region. The Deep South took Lincoln’s election as its pretext to secede, but the slaveholding border states hesitated to abandon the Union. Lankford focuses on these states, above all Virginia, where the calls of loyalty and secession seemed equally strong in early 1861. In his first inaugural address, Lincoln, whom radical southerners saw as embodying all the forces aligned against them, tried to balance firmness and conciliation. Fort Sumter became the test of the president’s intentions. Secretary of State Seward was among the advisors who tried to convince him to abandon it; the South, they argued, would come to its senses if not provoked. After some hesitation, Lincoln decided to re-supply the fort. When his intention became known, Confederate artillery quickly forced the garrison’s surrender. From that point, the border states began to tilt toward disunion. A Baltimore mob attacked U.S. troops on the way to Washington, and Virginia’s secessionists gathered support from moderates such as Jubal Early, a staunch Unionist who went on to become a Confederate general. By the end of May, when Kentucky left the Union, U.S. troops were already in Virginia, and war was a foregone conclusion. Lankford cites contemporary newspapers and journals and letters from ordinary citizens of both regions, as well as from national leaders. Though sometimes dry, a good summary of the run-up to our nation’s most destructive conflict.